Becoming our inviter, you will instruct newbie on how to make money with BitBattle and will increase your own incomes in return. On registering BitBattle, you have one and only one Referral code to invite other to join BitBattle with you. Go to Referral on Other menu to get your code. Instruct your friends to paste your Referral code when they first sign up with BitBattle as below; so that they will be recorded under your Referral line. Instruct newbie to join BitBattle telegram and fanpage to get the most up-to-date Battles and interesting Rewards. You can keep track on your Referral line in terms of their activities on BitBattle and your respective commission. For example, one user under your referral line deposits 10 ETH, 2.5 ETH will be converted to SPIN at preferred rate. You will receive 15% x 2.5 ETH = 0.375 ETH as a recognition of your contribution to BitBattle development and SPIN market. You can also earn more by encouraging users to open more Battle rooms and get their balance grown. If users under your Referral line win ETH in Battle rooms, you will receive 5% of their Rewards. Who can become BitBattle partner? 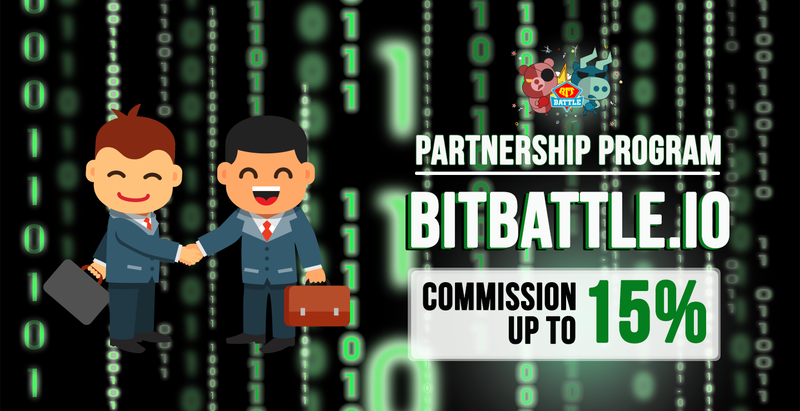 BitBattle Partnership Program welcomes all users who want to earn more income. New mode Altcoin rewards: predict the right direction of the next BTC/USD M1 candlestick and win XRP, XLM, KNC, TOMO and KATrandomly.